Now that I am a natural girl, free of chemical processes and products used in my hair care regimen, this is one item that I ALWAYS have in my arsenal of pre-made hair products. Let’s take a closer look. ‘After shampooing, apply to wet hair. Leave on as desired. Rinse thoroughly. Avoid contact with eyes. In case of contact with eyes flush thoroughly with water’. However, this is how I use it. I use it as a co-wash product for my hair. I wet my hair thoroughly, then I use it as a cleanser 2-3 times, massaging my scalp while I ensure that the whole head is saturated with the product. I use it in very generous amounts – thank God that it is reasonably priced! There are times when I am running low on my supply, and in those times, I will add some water to the half-full bottle and fill to about ¾ of the bottle, shake vigorously and use as usual. It still works wonderfully as a hair cleanser. There are times also, that I add it to my homemade recipe for a leave-in conditioner along with water and essential oils and a base oil of my choice. Water, Cetyl Alcohol, Cetrimonium Chloride, Stearalkonium Chloride, Fragrance, Glyceryl Stearate, Methylchloroisothiazolinone, Methylisothiazolinone, Disodium EDTA, Propylene Glycol, Soy Milk Protein, Fragaria Vesca (Strawberry) Leaf Extract, Polysorbate-20, Panthenol (Vitamin B5), Tocopheryl Acetate (Vitamin E), Ascorbic Acid (Vitamin C), Niacinamide (Vitamin B3), Biotin (Vitamin H), Red 33 (CI 17200). This moisturizing conditioner is for anyone who needs a product that will be gentle on their hair. It does not strip your hair of its natural oils. It works its magic gently, especially with the Soy Milk Protein that is a part of the ingredients. It is gentle enough for babies, children, and adults. 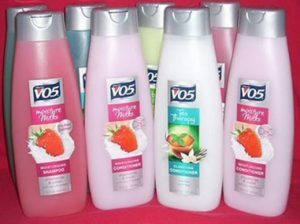 I can’t think of anything that I don’t like about VO5 moisture milks hair conditioner , strange as it may seem. It gives value for my dollar and I am happy with it. I love the VO5 Moisture Milks Hair Conditioner because of its versatility in my hair care regimen. I can use it as a cleanser, a conditioner, and even as a moisturizing leave-in. Have you ever tried it? How do you use it? I would love to hear your thoughts. Looking forward to your feedback in the comments section. Hello it is so good to see that you are promoting these products because I have brought these products before for my wife and to tell you the truth they are really great especially the aroma it is just out of this world. Your post is well detailed and informative as always. Welcome back and thanks for stopping by. Your comment made me smile. I love when a man goes shopping for his wife and family, especially with a sensitive item as female hair products. Hats off to you!! It is also nice to know that you like the product, even from a smell point of view. It shows that you do snuggle up to your wife’s hair enough to notice. Too cute. I have not used it in a while and cannot remember using the Moisturizing Milk Hair Conditioner. I am using products that can help my natural hair. Now that I have read this post I will certainly give it a try. I like that it is so versatile. Is there a hairdressing that goes with it? Yes, VO5 has been around for a spell. It just goes to show the age and strength/reliability of the product. The moisture milks line is new but so good and moisturizing for your hair. You should give it a try. And yes, being natural, it is a great co-wash conditioner for your hair regimen. It will be a great product for your hair. There is a VO5 hairdressing product but I have not tested it for myself. Maybe I will and write a review for you. Please visit again when you have some time. As a matter of fact, maybe you can add your email to my mailing list and you will be notified of any new articles that I create, so this way, you will be informed once I do a review for the hairdressing. I would love to hear your feedback on the moisture milk once you give it a try. Thanks for this post and I have used VO5 both shampoo and conditioner but I have to say that it was a long time ago. I will need to give it a try again I think but as I have greasy hair, I need to get one that doesn’t make it worse. Do you know if they have any specifically for greasy hair. I do like to use conditioner that smells nice and leaves your hair feeling nice and gives it a lovely shine. Yes, VO5 goes way back. The VO5 moisture milks line is a gently cleansing line. I think the only way you will know if it helps your hair issue is by giving it a try. It is not easy to ‘prescribe’ a solution unless there is a ‘hands-on’ analysis of any hair issue. The price is reasonable enough to make a commitment. Worst case scenario, if it does not work for your hair, you can use it as a fabric softener. Please give it a try and let me know how it turned out. I have read your article and I really like it. I have seen Alberto V05 ever since I was a kid. I looked it up and they started making the product ever since the 1950’s. That is quite a long long time. As you say in your article,it is a well-known brand in the hair industry. I am a father with two daughters. I just might throw a few Alberto V05 in the shopping cart the next time I go shopping with my girls. Who knows, they might end up liking it. That would be a lot of savings for me as the price is so reasonable. A win win for everyone. Thanks for stopping by, Pelesio. Yes, VO5 has been around for quite a while. I grew up with it. It is almost like a household name. Not only is it reasonably priced, but it packs a punch in what it will do for your hair. I am happy that you are willing to have your daughters try it out. You can too, Pelesio, anyone’s hair can always use some TLC, softness and some sheen. By all means, please let me know your feedback when you do. What I love about the VO5 line of products is that they smell so great, are really effective at what they promise to do and the added bonus is that their products are so affordable. Just about anyone can use VO5 regardless of hair type. I use VO5 all the time and can vouch for this great product. Thanks for stopping by, Kevon. It is great to have a man’s point of view about this product. I love VO5 because of its quality, flexibility, and affordability. It is nice to know that a guy not only ‘approves’ of the product, but also ‘uses’ it. Thanks for your thoughts, Kevon. I am sure you can see me smiling.